Four UN peacekeepers were killed on Wednesday when a mine exploded under their vehicle in central Mali in a deliberate attack, capping a bloody week for civilians and security forces in the West African nation. Jihadists have ramped up their activities in central Mali in recent months, targeting domestic and foreign forces in violence once confined to the restive north. 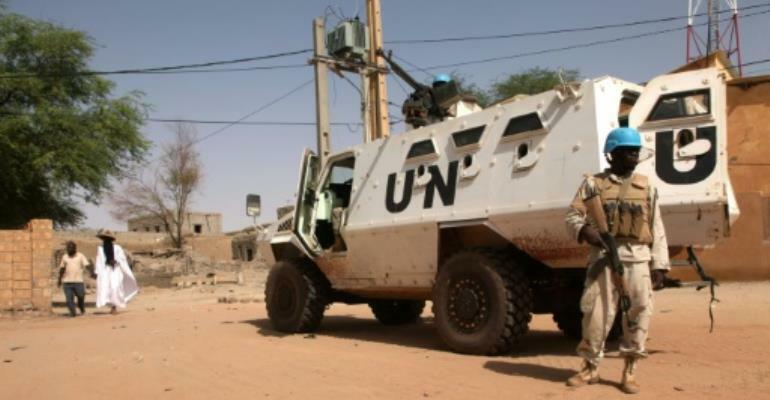 The UN said in a statement that the "explosion of a mine or IED against a MINUSMA vehicle on the Boni-Douentza road" in the Mopti region killed the four peacekeepers and wounded four more. The mission, known by the acronym MINUSMA, counts almost 11,000 peacekeepers and has been deployed in Mali since 2013 to counter a jihadist insurgency and general lawlessness. "MINUSMA is currently upgrading its security presence in central Mali," Mission chief Mahamat Saleh Annadif said. "Cornered, the terrorists are multiplying their attacks." Six Malian soldiers were killed on Tuesday when their vehicle struck a mine, the army said on Wednesday, and a forest ranger was gunned down in a third incident blamed on jihadists. Mali's military is frequently accused of abuses themselves, with families on Wednesday pointing the finger at the army in the killing of seven civilians during an operation in the same area a week ago. A UN report published this month found that "at least 20 percent" of recorded incidents in 2016 and in the first of half of 2017 that endangered civilian lives involved the Malian authorities -- essentially the security forces. Nouhoun Sarr, the nephew of one of seven men killed on February 21 after their arrest by the military, said the authorities informed him on Wednesday morning of his uncle's fate. "They called us to tell us our relatives were killed during the operation, without elaborating," he told AFP. Yehia Ag Mohamed Ali, a former minister and member of the opposition Sadi party, told AFP: "According to our information, the seven civilians arrested on February 21 by the Malian army in Sokolo were killed by soldiers." The government said in a statement on Wednesday that the army was "carrying out reconnaissance missions and searches in the Sokolo area, during which civilians unfortunately lost their lives". "An enquiry has been opened," it added. Islamic extremists linked to Al-Qaeda took control of the desert north of Mali in early 2012, but were largely driven out in a French-led military operation launched in January 2013. In June 2015, Mali's government signed a peace agreement with coalitions of armed groups. But the jihadists remain active, and large tracts of the country are lawless.